I received a letter in the mail a few months ago asking me to join the Arbor Day Foundation. I looked through the literature and noticed that they were offering 10 free trees if you became a member. It sounded like a good deal. I like planting trees anyway, and I am also a big believer in protecting the environment. So I decided to become a member. The literature said I would receive my trees around the best time for planting in my area, which is North Alabama (USDA Plant Hardiness Zone 7). The trees arrived by the US Post Office around the end of March. 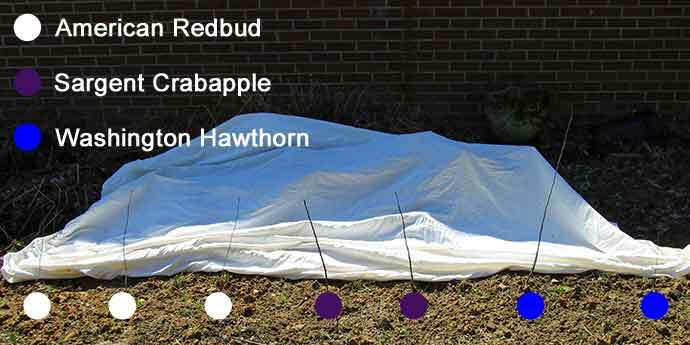 I received 2 Sargent crabapples, 3 American redbuds, 2 Washington hawthorns, and 3 white flowering dogwoods. As a bonus they sent me 2 crapemyrtles. So I really got 12 trees instead of 10! Arbor Day ships twice a year. The trees are shipped dormant so they don’t die. They do spring shipping and fall shipping. The spring shipments are made between February 26 and May 30 based on your zone. Fall shipments are made between November 1 and December 10. In the fall, they wait for the trees to experience a few frosts before they ship. This way the trees are dormant. The trees can be planted until the ground is frozen solid. The trees came in a long plastic bag. The trees are dormant and are tiny little things. I don’t think any were bigger around than a pencil or more than about two feet long. This makes sense though because there would be no other way for them to send you 10 trees through the mail. If you have tried to ship anything through the mail lately, you know that shipping rates are quite expensive. The instructions say to remove the trees and soak them in a container of water for 3 to 6 hours. I have a filter on kitchen sink faucet, so I filled a 3 gallon bucket about halfway full with filtered water. You can probably get away with using plain tap water if you don’t have a filter. If you use chlorinated water, you might want to put a little dirt in the water to bind the chlorine. I wasn’t able to get mine planted right away, so they stayed in the water for over thirty hours. I hope this didn’t hurt them. I guess we will find out soon enough. I have not decided where to plant the trees yet. So what I did was temporarily plant the trees about a foot apart in a row behind the house. The trees have to get regular water during the first year, so I wanted them to be close to my hose bibb. I don’t have time to go all over the property watering trees this summer. Later when I decide where to plant each tree, I will dig them up and transplant them to their new locations. Also I expect that some will not make it. Planting them in this temporary spot will let me find out which ones are going to make it before I spend all that time finding locations for the trees, permanently planting them, watering them all summer, etc. To plant the trees, first I got out my 4 cycle string trimmer that has a tiller attachment. I tilled up a 12 foot strip. Then I planted the trees along that strip, digging as necessary with a metal garden trowel. After I got them all planted, I watered them in really well. I have pictures of my trees below. I have added a color coded legend to show which tree is which. I know they all just look like twigs right now, but I thought this would help me out later. I doubt I will remember which tree is which next year. I can just come back to this post to see what each tree is. Plus it will be fun to take pictures every year and compare the growth of each tree. The crapemyrtle (Lagerstroemia indica), also spelled crape myrtle and crepe myrtle, is a fast grower and reaches 15 to 20 feet tall with a 6 to 15 foot spread. The trees bloom from spring to fall. The flowers are usually either red, pink, or white. I don’t know what color the flowers on mine will be. I guess it will have to be a surprise. A lot of people prune these trees back severely in a practice I like to call “crape murder”. I am going to let these grow in a more natural manner and see how they turn out. I might see if I can plant these in the front and let people see what a crapemyrtle that hasn’t been “murdered” looks like. The white flowering dogwood (Cornus florida) is a moderate grower and reaches a height of about 25 feet with a 25 foot spread. It has white flowers in the spring and then forms fruits which last into fall. The fruits are a food source for birds. In the fall the leaves turn red. These trees do best if planted in an area that has some afternoon shade. They don’t like a lot of heat. I think I will plant the dogwoods in the front lawn. The American redbud (Cercis Canadensis) is a moderate grower and reaches a height of 20 to 30 feet with a spread of 30 feet. It has pink flowers in the spring. The leaves turn a nice yellow in the fall. It also has seed pods that hang off the tree through the winter. I don’t want those getting in my gutters, so I am going to plant these trees away from the house. The Sargent crabapple (Malus sargentii) is a slow grower and reaches 6 to 10 feet tall with a 6 to 12 foot spread. It gets wider than it gets tall. it has white flowers in the spring, then has red berries into the winter. The berries have a sweet flavor and are a food source for birds. I think this tree would be better for the back yard since it is low and bushy. I am thinking that an area close to the property line would be ideal. It might make an ok privacy screen in the summer, although there are much better trees to use for that purpose. The Washington hawthorn (Crataegus phaenopyrum) is a moderate grower thats grows to 25 to 30 feet tall and 25 feet across. It has white flowers in the spring followed by red fruits that last into the winter. Birds and squirrels like the fruit. People all over the world eat “thornapples” as well. Some studies have shown that hawthorn extract has properties that can treat cardiovascular disease. The wood of the hawthorn is said to be very hard and strong. People use it to make tool handles among other things. The tree has large thorns. I can see how small children might get injured on the thorns. I think it would be best to plant these trees out of the way where children will not be playing. I find the hawthorn tree very interesting. I am glad I found out about them. Well that is about it. All I can do now is wait and see if I get some leaves on those little twigs I stuck in the ground the other day. Going forward I will update this post to show you the progress of these little trees. I might even taste some of the fruits in a few years and see how they taste. 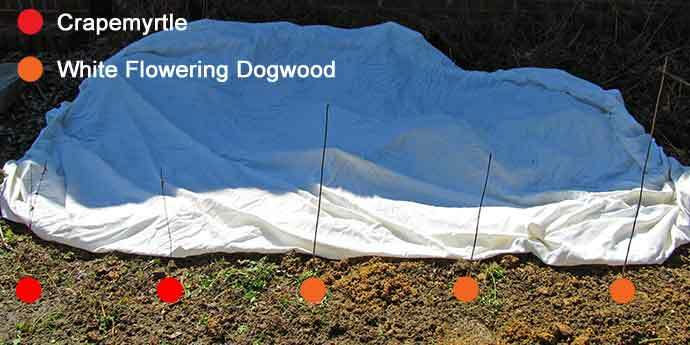 Please leave a comment if you have grown these free trees as well. 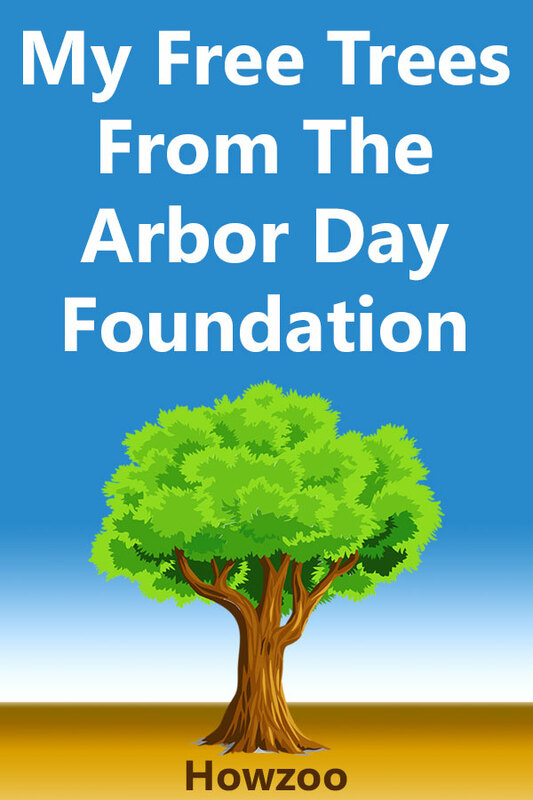 The Arbor Day Foundation is a non-profit organization dedicated to planting trees. The organization has almost 1 million members. It was started in 1972 by John Rosenow. Goals of the organization include building greener communities, replanting damaged or diseased forests, and educating children about nature. I am so happy with my crepe myrtle I got from the Arbor Day folks! It is still blooming a bit (Aug. 23 in S.E. PA) I am also happy with the leaves and pretty bark on this fast growing shrub.I will let it grow natural. It was strategically placed to provide a little privacy when I’m working in the garage and to grow as big as it wants without interfering with power lines. I also received my 10 free trees plus 2 crapemyrtle. When did you receive yours and what part of the country are you located in? Mine arrived Nov. 24th and we now have a light coating of snow on the ground. I am in MA. Any thoughts as to how to keep these alive till Spring? I got mine at the end of March in North Alabama USDA zone 7. According to this FAQ page, you should plant them now as long as the ground isn’t frozen solid, which I don’t think it would be in MA. Since they are dormant, they should live through the winter and wake up in the spring. You need to keep them cool and plant them as soon as you can. Don’t let the roots dry out. I would dig holes, plant the trees, put the same dirt you just dug out back in the holes, mulch, and then water them in. I don’t think snow or the cold will hurt them after you get them mulched and watered in. I also updated the post to include my USDA zone and info about the ADF spring and fall shipping dates. Hi Jeff, could you update us on how your trees are doing? I got mine today and was wondering how they will look like 4 years later! Thanks! I am working on a major site update. Hope to update this post soon with the status of the trees. My 10 trees have spent a year in my back yard. They all have leaves and have at least doubled their height. I wish I knew the color of the crape myrtle, but I will just have to be surprised. They got through the NC mountains winter with no problems. They are in part shade and doing well. I planted all mine in temporary containers (I only received 11 but am not complaining!) And 6 of the 11 have beautiful little leaves after one month! I am curious what color crapemyrtle everyone received for those who are blooming already? ?